I made a flowchart describing the process of culturing wild yeasts. What do you think? Right-click to save a larger version. I deliberately left it a little vague because I found many conflicting points of view and too many details make a relatively simple process rather confusing. I wanted to describe a process that should succeed every time, although there may be a lot of things that can be done to speed up the process. Please comment on it and/or improve it. The original file is here. It can be edited with Inkscape. Edit: I revised it to add a few corrections. Edit 2009/01/15 - version 1.2 - more clarifications. It's public domain. I quoted that from the Creative Commons site. I want people to be able to use/modify and redistribute this if it's useful. The intial daily feeding is to remove half and add just flour? Not water? Some text got cut off. Thanks for noticing. It's fixed. Very nice. 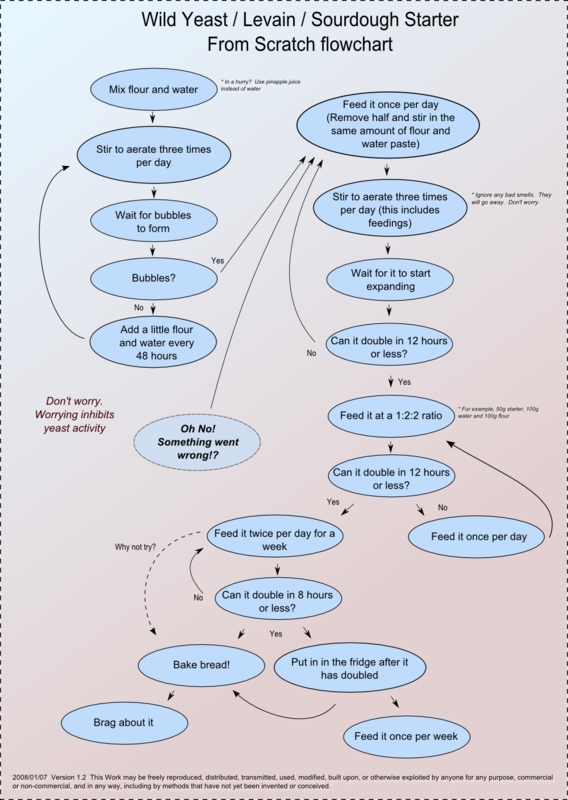 I appreciate flowcharts as I was an IT person in a very past life :) Just a few suggestions, you might want your processes to be in rectangles, input/output (adding/taking away ingredients) in parallelograms, and decisions (if-then ?) in diamonds. I tried downloading and editing but could not get the file to open properly. Sounds complicated. Do you think the average artisan bread enthusiast would appreciate the proper use of the various geometric shapes that much? But please feel free to modify and improve upon the original. The file opens fine in Inkscape in Linux and Windows for me. It probably doesn't open properly in any other kind of image viewer. What did you use to try to open and edit it? original flowchart works fine. the suggestion was mostly for technicality, i'm just weird like that. i did not download inkscape as i have not reviewed the specs but just used the default viewer from my computer. i'll look into inkscape. thanks. But back to my question. I'm on day three and the water is separating out from my levain way more than it shows in my book. Will that be problematic, and what could be a cause? Anyone? I edited the original post and inserted the new version. Again, if anyone thinks something is wrong or should be done differently, please let me know and I will try to adjust the flowchart to include those improvements. Also. is it too complicated? Personaly, I had to make this for myself. I found that trying to follow these instructions from a printed page is hard because I kept having to try to figure out "where I was" in the process. In that sense, I find a flowchart easier to follow. Appreciate the thought and effort that went into the flowchart. It certainly goes a long way to simplify what could be a complicated process. 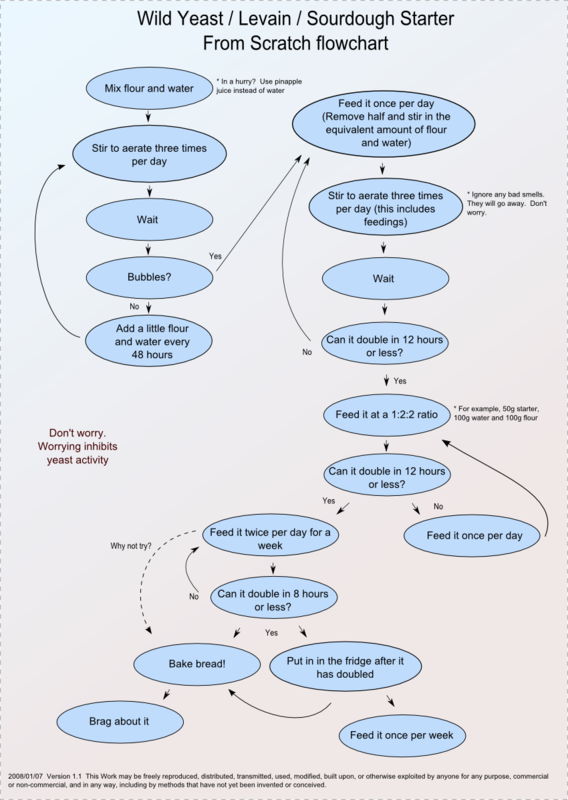 My perspective is that the flowchart is probably helpful to bakers who have experience in creating starters. For those naive to the process, it provides a good overview and dimensionalizes the complexity, but leaves important gaps (e.g., when waiting, when exactly do you wait? ). I think I would do well to read more about the subject from this site. Your flowchart will serve as one of my resources. cake diva, I started a Sourdough 101 blog the other day to try to demystify the process of creating a sourdough starter. Look under blogs on the main page. I've posted for two days so far (it's a live experiment) and added pictures last night. I will add Day 3 this evening. Cake Diva, thanks for your comments. What I am trying to accomplish with the flowchart is exactly what you describe. For example, add flour and water and wait until bubbles are seen. It may take two days or three. When it happens, move on to the next step. The same goes for the other steps, you don't move to the next loop until the starter can double in size within a certain time frame. Now, how can I make that more clear on the flowchart? 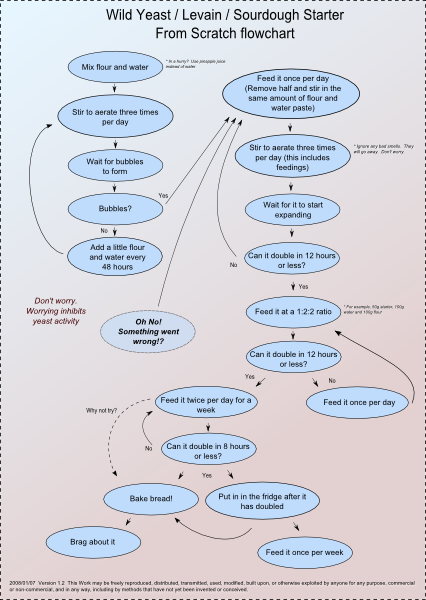 I think that having a flow chart at all just describes the non-linear nature of the process. I know I'm 16 months too late buuut... I think simply adding that this flow chart is best used as a supplement to a more detailed set of instructions, especially if you are a beginner, is enough. Have you considered adding pictures to help clarify each and every step of the process. This may help the new-comers to the bread baking world. Make it like a story board, providing visual aids. Someone (not me - someone with graphics talents) should add maybe pale background photos of bread and turn this into a poster! I did see it, but now the thread is longer, it won't download, at all. Do you mean that since I edited the original post, you cannot download the larger version? When I open the thread, there is a white space where it should be. Your browser cached (kept a copy) of a bad link, I guess. You can clear your cache. I think pressing CTRL-F5 will reload the current page and refresh the cache. Thanks for posting the flow chart. I had no problem saving the file. Only, wish I had had this years ago. 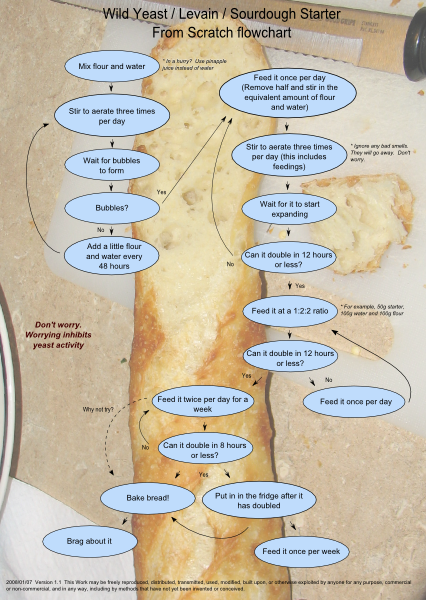 It should be very helpful to folks trying to understand sourdough feeding and build cycles. 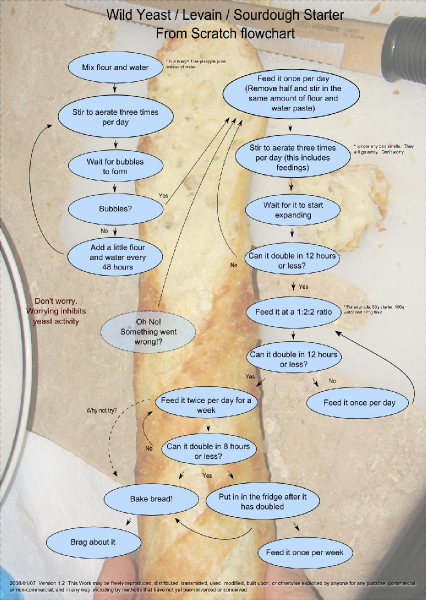 I like Rosalie's idea of turning it into a poster with bread photos embedded. Any suggestions for a photo? Or maybe a combination of photos? I really like that chart! Thank you. I have had some experience so I appreciate the exactness of a "recipe", but now I really appreciate a flowchart method. Thank you for your time and effort doing this. I'm not going to compare, but I believe the two flow charts are now different. The first chart was tweaked, and the second was changed graphically. Can we get the tweaked chart with background graphics? That photo is of yeasted bread, not sourdough. Oh! I feel so dishonest! I was trying to explain to my mom (the engineer) how to care for and use the bit of starter that I had given her. This will help tons, thanks. Love the chart, especially the end! If you changed the shapes, my brain would shut down in protest. Is it necessary to take half of my starter every few days? This starter I made only has about a cup in it. I wanted to start a starter that is only fed 1/4 water and .7 ounces of flour so I don't have to throw out a lot of flour. I have seen some people that have said yes and some have said no. What I would like to know is it ok if I continue to feed it without throwing starter out. Obviously if I need to build starter so I have enough to make bread, then I don't throw any out. Except I have seen I should build my starter in one day enough to make bread then go back to my regular feeding. That doesn't sound right to me. I haven't been making bread very long and I have only been making potato flake sourdough which is different. I could use some help! !